We Thais and our rivers have long been good old friends. We rely on water for just about everything from rice growing, going to places by boat, to even selling all kinds of goodies at floating markets. It’s quite likely that you’ve already checked off one famous floating market on your Thailand to-go list. Most of them are weekend floating markets, though. But don’t fret, here’s a list of local floating markets near Bangkok you can discover on weekdays! 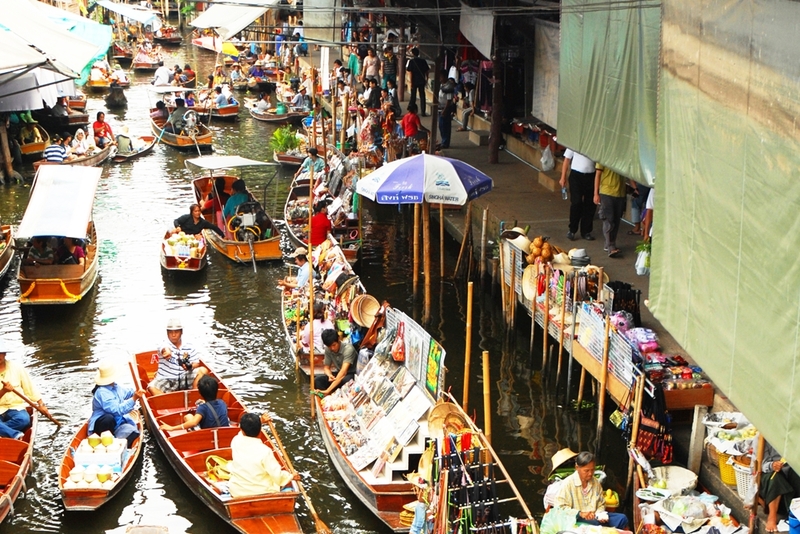 This world-famous floating market in Ratchaburi is just a few hours from Bangkok. We recommend getting there early, as the market starts to close down at around 2-3 p.m. Originally a canal named during the reign of King Rama IV, Damnoen Saduak Canal is the source of more than just a floating market. It acts as a water resource for farmers, which results in an abundance of fruits and vegetables in this region. Although it is always packed with tourists, our local expert will happily take you on a long-tailed boat to experience the local lifestyle along the canal. What’s more, you can also visit the famous Maeklong Railway Market in the neighboring province of Samut Songkhram along with Damnoen Saduak Floating Market in one day! Besides Damnoen Saduak Floating Market which you can find out more here, Ratchaburi also offers Instagram-worthy ceramic garden, stalagmite-filled cave and 9-tiered waterfall. For more ideas on things to do in Ratchaburi, click here. 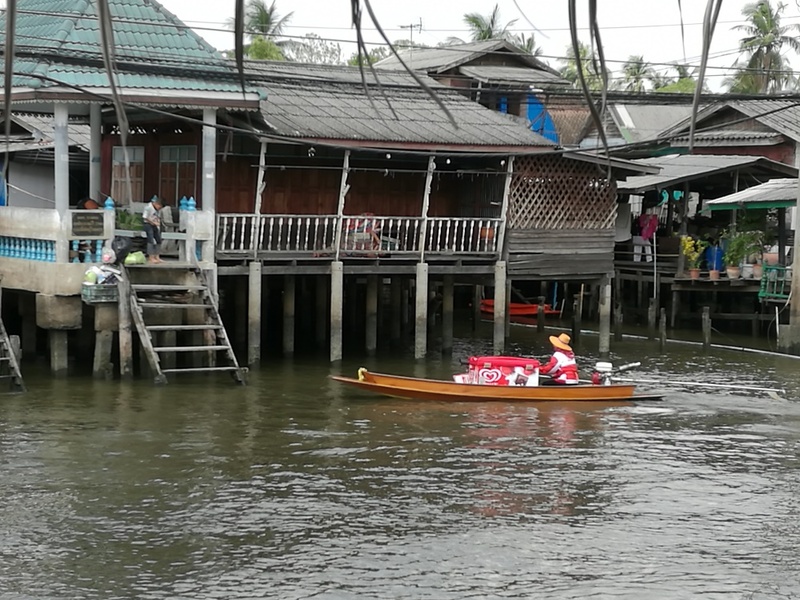 Although some prefer to call it a riverside (rather than floating) market, Don Wai Market is still highly recommended for food scouting and local life observing. The shops selling all kinds of edibles are located up on the riverbank, and you can cruise along the river while lunching as a local. The best part is that it only takes less than couple of hours from the center of Bangkok! Explore Don Wai Market by private car with our Local Expert here. How often would you see an ice-cream stall coming on a boat! Even Thais would need a huge stroke of luck to experience such childhood dream. You can find unique experiences here in Wat Takien Floating Market, which is less than a couple of hours from the center of Bangkok (in Nonthaburi province). The best part is that you are most likely to run into zero tourist at all! Its authentic local vibe well preserved, Bang Phli Floating Market is a true hidden gem for those seeking to go beyond the surface while visiting a foreign country. Plus, it’s only an hour’s drive from Bangkok, in the neighboring Samut Prakan Province. Similar to Don Wai Market, vendors are no longer rowing their boats here. But the plethora of delicious and cheap local food stalls here more than make up for it. In addition, you can hop on an old school long-tail boat and take in the simple and laid-back local lifestyle along the canal. To make the most out of your trip to Samut Prakan, take a look at a Cycle Tour along the nature trail or a Local Food Tasting Trip here. TakeMeTour hopes our weekday floating markets guide by locals will inspire you to explore the floating markets in this list. Don’t forget to bring your camera, wallet, and your empty stomach along as well!